The presence of the separation wall can be felt from the entrance to the apartment. Although all benefits could be seen just from the inside of the apartment. It adds feeling of movement and hidden spaces because of its diagonal form. The furniture in the apartment correspond to futuristic design. It is simple with straight lines. The same could be said about colors in use. 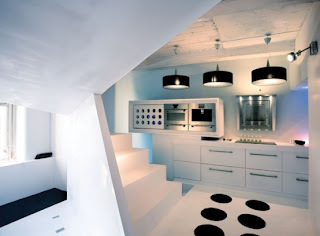 Black and white is always part of futuristic interiors. In the end, the apartment design with all its experiments made small space look much more bigger than it is.